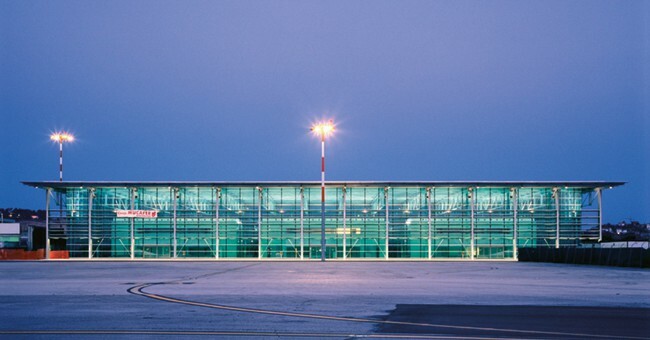 The new terminal of Ancona’s “Raffaello Sanzio” airport was designed by architect Volkwin Marg. 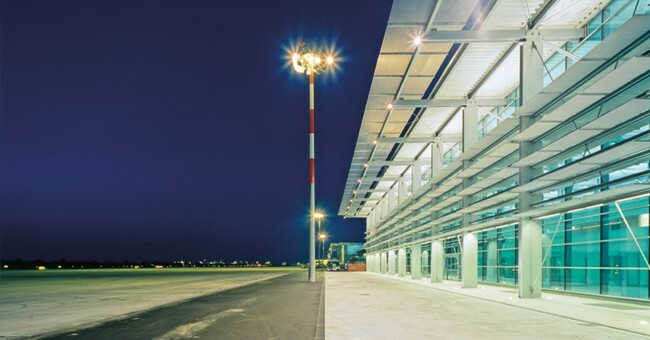 It is part of a larger extension plan started in 2000 and aimed at responding to an increase in the number of passengers arriving at and departing from the airport. 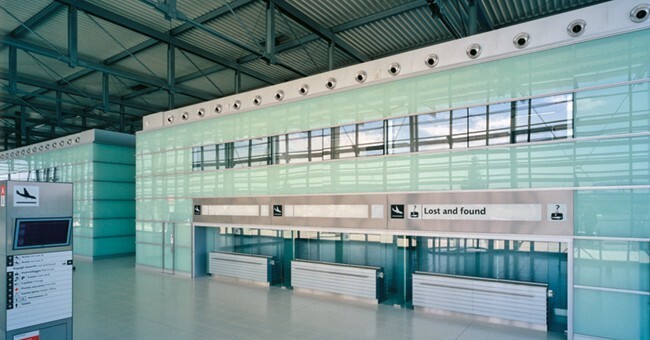 The existing terminal, built in the late 1970s, had already been adapted several times, but proved inadequate to meet the increased demand. 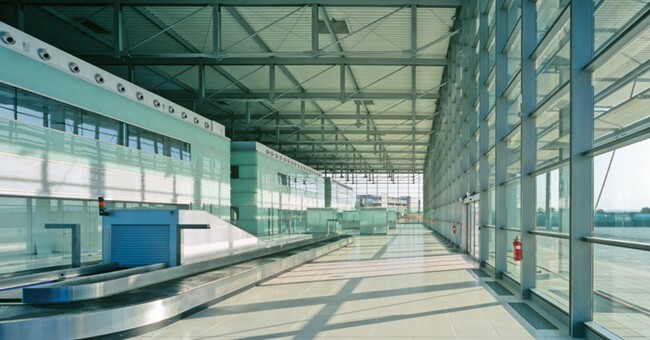 The company Aerdorica therefore decided to build two new halls near the old terminal. The two rectangular-shaped buildings are fully glazed and are characterised by great formal simplicity and the transparency of their surfaces. The use of glass for façades and steel for structures, together with the lack of pillars, create an inner and outer space without visual obstacles. 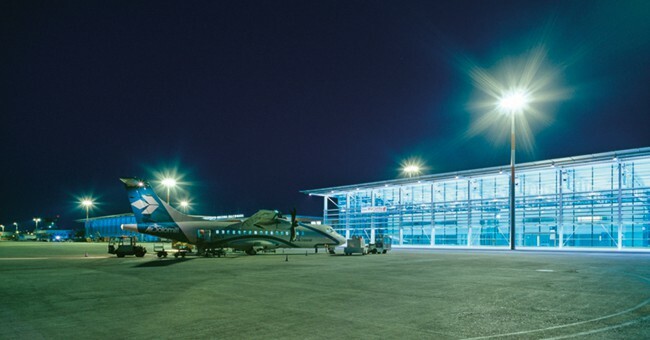 The simple distribution of spaces and the brightness of the rooms give the new terminal a feeling of space and light, allowing a wide view on the runways and the aprons. By separating arrivals and departures on the same level, it has become easier to identify the paths inside the terminal. The new halls have a structure made of 48 m long steel trusses, each at a distance of 7.2 m, bearing the aluminium roof and supported by the secondary beams. The perimeter columns support the roof and the façade windows. Uprights and crosspieces in stainless steel house the glass modular panels measuring 240 cm x 115 cm, with a total thickness of 30 mm. Three two-floor glazed structures were constructed inside the two new terminals to host offices for airport-related activities and commercial spaces. These volumes, illuminated from the rear, are designed as autonomous buildings, made of metal and glass. The lightweight effect is obtained through a careful study of colours and materials: silver grey for the structure and fixtures, frosted glass for the functional blocks and stainless steel for casings and pieces of furniture. Particular attention has been paid to reducing energy consumption and operating expenses, favouring architectural solutions and a use of materials that would reduce energy dispersion and heating on the glass surfaces. The projecting roof and an efficient sunshade system thus become not only functional elements, but also a characteristic decorative motif.